The Toxic Lure of "Guns and Butter"
The current political brawl over next year's budget is highly significant. With Democrats in a House majority for the first time in eight years, Speaker Nancy Pelosi and most other party leaders continue to support even more largesse for the Pentagon. But many progressive congress-members are challenging the wisdom of deference to the military-industrial complex and, so far, they've been able to stall the leadership's bill that includes a $17 billion hike in military spending for 2020. An ostensible solution is on the horizon. More funds for domestic programs could be a quid pro quo for the military increases. In other words: more guns and more butter. "Guns and butter" is a phrase that gained wide currency during escalation of the Vietnam War in the mid-1960s. Then, as now, many Democrats made political peace with vast increases in military spending on the theory that social programs at home could also gain strength. It was a contention that Martin Luther King Jr. emphatically rejected. "When a nation becomes obsessed with the guns of war, social programs must inevitably suffer," he pointed out. "We can talk about guns and butter all we want to, but when the guns are there with all of its emphasis, you don't even get good oleo [margarine]. These are facts of life." But today many Democrats in Congress evade such facts of life. They want to proceed as though continuing to bestow humongous budgets on the Pentagon is compatible with fortifying the kind of domestic spending that they claim to fervently desire. Democratic leaders on Capitol Hill have reflexively promoted militarism that is out of step with the party's base. 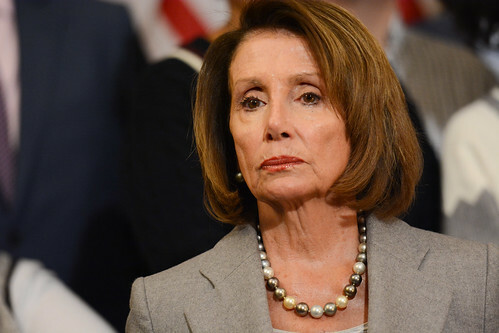 In early 2018, after President Trump called for a huge 11 percent increase over two years for the already-bloated military budget, Pelosi declared in an email to House Democrats: "In our negotiations, Congressional Democrats have been fighting for increases in funding for defense." Meanwhile, the office of Senate Democratic leader Chuck Schumer proudly announced: "We fully support President Trump's Defense Department's request." What set the stage for the latest funding battle in the House was a Budget Committee vote that approved the new measure with the $17 billion military boost. It squeaked through the committee on April 3 with a surprising pivotal "yes" vote from Rep. Barbara Lee (D-Calif.), who is now among the lawmakers pushing to amend the bill on the House floor to add $33 billion in domestic spending for each of the next two years. As Common Dreams reported last week, progressives in the House "are demanding boosts in domestic social spending in line with the Pentagon's budget increase." But raising domestic spending in tandem with military spending is no solution, any more than spewing vastly more carcinogenic poisons into the environment would be offset by building more hospitals. Rep. Ro Khanna and Congressional Progressive Caucus co-chair Pramila Jayapal, who both voted against the budget bill in committee, have said they won't vote for it on the House floor. In Khanna's words, "You can't oppose endless wars and then vote to fund them." Jayapal said: "We need to prioritize our communities, not our military spending. Progressives aren't backing down from this fight." The New York Times described the intra-party disagreement as "an ideological gap between upstart progressives flexing their muscles and more moderate members clinging to their Republican-leaning seats." But that description bypassed how the most powerful commitment to escalation of military spending comes from Democratic leaders representing deep blue districts in Pelosi's case, San Francisco. Merely backing a budget that's not as bad as Trump's offering is a craven and immoral approach. Sen. Bernie Sanders' staff director, Warren Gunnels, responded cogently days ago when he tweeted: "How can we keep giving more money to the Pentagon than it needs when 40 million live in poverty, 34 million have no health insurance, half of older Americans have no retirement savings, and 140 million can't afford basic needs without going into debt? This is insanity." Yet most top Democrats keep promoting the guns-and-butter fantasy while aiding and abetting what Dr. King called "the madness of militarism."